Rosalie Sorrels, playing the Narrows Friday night, was featured in today's Providence Journal. Narrows fave--and one of the strongest up-and-comers we've seen--Eilen Jewell was interviewed recently. Eilen will be at the Narrows this weekend. Tickets are selling well but are still available. What can one say? Bettye LaVette and her band put down some smokin' soul Friday night at the Narrows. John Stewart, a longtime member of the Kingston Trio, who had a hit with Stevie Nicks in the 1970s with a song called "Gold" ("People out there are turning music into gold..") has died. Tom Rush, Kate Taylor and Pendragon will be added to the schedule verrry soon. The Elevator Is In, Baby! Your fashionably attired blogger recently demonstrated the use of the new Narrows elevator. Yes folks, it's finally here! After five years climbing those steps, your blogger vows to climb no more! Congrats to Narrows prez Patrick Norton and program director Deb Charlebois, and everybody else involved in making this happen. By the way, the Narrows is about $15,000 short on paying off this puppy, so if you can help let us know! On the eve of the release of a new recording, Roomful of Blues trumpet player Bob Enos died. Friday night saw the return of a Narrows favorite--Old School Freight Train, up out of the great state of Virginia. 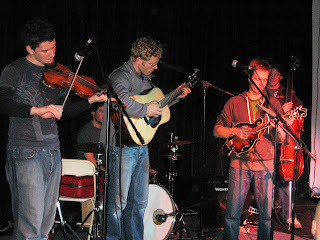 It was something like the 3rd visit for this young progressive bluegrass--or whatever you call it--group of young guys (the oldest is 30 years old). And the audience continues to grow. That's what we like to see--audience development. 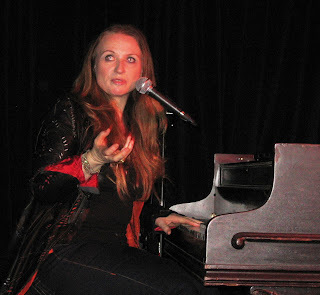 Jazz singer/songwriter/comedienne--yes she is verry funny--Judith Owen charmed the Narrows crowd Thursday night. The Wales native--now living in LA with husband Harry Shearer (you know, he's involved with The Simpsons)--opened the show with what might be termed a "smooth jazz" take on Deep Purple's "Smoke on the Water." Then it was off to the races for an evening of funny stories and excellent musicianship. It was the first visit for Dame Judith, but we hope to bring her back again. Watch this space! Thanks to our volunteers, patrons, extended family, sponsors and our board of directors, the Narrows Center for the Arts had a banner year in 2007. The biggest accomplishment was the completion of our long awaited elevator project. The elevator is complete and we are just waiting for the state inspection before it goes online. A lot of grunt work, fundraising and coordination of efforts took place to make this $192,000 project happen. In particular, I want to thank Congressman Jim McGovern who secured $100,000 from the federal government, architect JoAnn Bentley for her tireless effort and expertise and Collins Construction for their fine work. We are in the process of installing a handicap bathroom which will complete our accessibility. 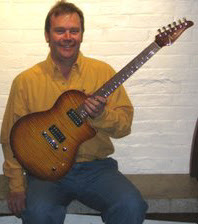 A special thank you to patron and friend Matt Brown for donating 24 guitars worth over $35,000 to make this project happen. Concert attendance significantly increased in 2007. We were awarded a Best of Rhode Island award for "Destination Concerts" by Rhode Island Monthly. Not bad for a Massachusetts-based venue. A special thanks here to local businessman Alan Amaral for donating $20,000 worth of sound and lights. We are in the process of installing the new lighting and improving our concert sound. We will continue to strive to have the finest acts, best sound and provide the ultimate concert experience. On the visual arts front, we recently signed a collaborative agreement with the Fuller Museum in Brockton to bring in museum quality art shows. The first of which is "Pulp Function" which debuts on February 15. This is an amazing exhibit with all the items created in paper. We will be bringing in over 1,000 local public school kids to view this exhibit. We are in the process of renovating our gallery to give it a whole new look and feel. The 6th Annual Narrows Festival of the Arts was a smashing success. Attendance was great and we had over 40 visual artists. The music absolutely cooked with great sets by Cassandra McKinley, Buckwheat Zydeco and many others. The unique pairing of New Orleans legends Leo Nocentelli and Henry Butler tore up Anawan Street. The children's venue was a lot of fun and this event has become the premier family arts event in Southeastern New England. Thanks to Sovereign Bank and the Massachusetts Cultural Council for keeping this event free. We have long boasted of the fact the we are run entirely by volunteers. And what a great group of volunteers they are. A lot of work goes on behind the scenes to produce the many great events that happen each year at the Narrows. It's quite amazing. We are at a transition point and we are so happy to announce our first employee will start on January 2. Our new director of operations is Deb Charlebois. Many of you who frequent the Narrows already know Deb. She has been at the heart and soul of so much of what we do for so long and she is an amazing talent. Bringing her on full time will allow our venue to continue to grow and prosper. Once again, thanks to everyone who had a hand in our success this year. We will never take any of you for granted. We will continue to improve and excel while maintaining our core mission of providing high quality arts to as many of you as possible.